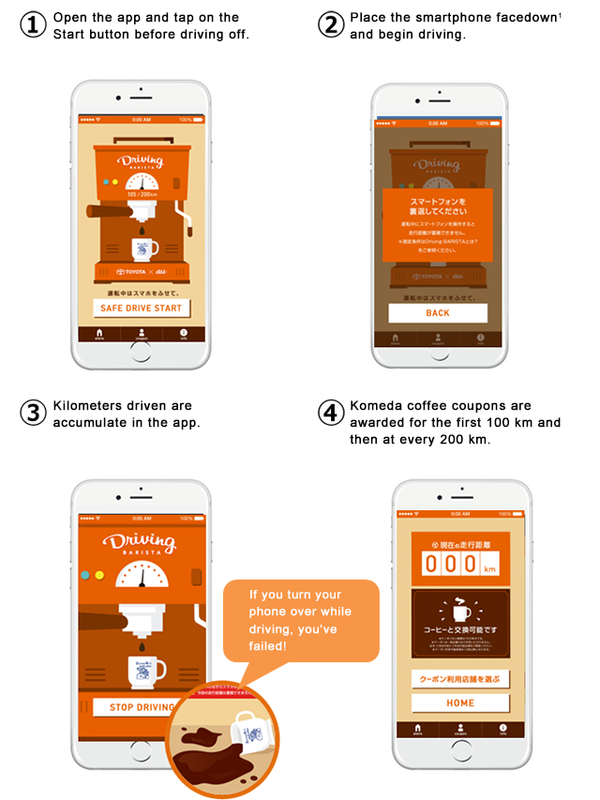 TOKYO, JAPAN, October 13, 2016 – Toyota Motor Corporation (Toyota), Komeda Co., Ltd. (Komeda), and KDDI Corporation (KDDI) have been running a project that utilizes a smartphone application called Driving Barista. The project aims to reduce the number of traffic accidents in Aichi Prefecture in Japan which are caused by drivers using their smartphones while driving. During the 17 days between September 20 and October 61, the application was downloaded about 37,000 times and was used to record about 2.6 million km of distance driven. This means that a cumulative distance equivalent to about 65 trips around the earth, or about 7 round trips from the earth to the moon had been driven safely by drivers while refraining from using their smartphones. The project gave in a fun way those who actually used the application to increase their level of awareness about reducing traffic accidents, and has helped many people inside and outside of Aichi Prefecture understand the importance of preventing smartphone-related traffic accidents. Coffee coupons issued in exchange for the accumulated distance driven can be redeemed at Komeda Coffee Shops2 across Aichi Prefecture through October 31. A final report that will include the number of coffee coupons redeemed will be issued in early November. Toyota, KDDI, and Komeda will continue to actively engage in new initiatives that are targeted toward solving social issues. 1The project duration differed for some models. 2Coupons may not be redeemable at some store locations. Participating store locations are indicated in the app.